She closed the lid of the suitcase. Can you get the lid off this jar? Dust particles must have got into the motor. On the eastern horizon, a huge cloud of smoke from burning oil tanks stretched across the sky. It took a while for the silt and mud to settle. Flakes of snow settled on the windscreen. It’s one of the most annoying customs in many relationships, when one forgets to put the lid down before flushing the toilet. But now a scientist has waded into the years old debate and explained exactly why people have a reason to moan about the disgusting habit. Charles Gerba, a professor of microbiology at the University of Arizona, said: ‘You get a good spray out of the toilet area. ‘When droplets come out of the toilet, it looks like the Fourth of July.’ July 4 is a federal holiday in the US to celebrate its independence. She just waded in and gave the kid a smack. Even when she knows nothing about it, she wades in with her opinion. If there’s a problem, she’ll wade in without hesitation and try to solve it. Thelma’s always moaning (about something), and forgets how lucky she actually is. Ben was moaning about his job again. “I don’t like potatoes,” he moaned. First she moans (that) she’s too hot, and then that she’s too cold. After a lot of moaning and groaning, they eventually started work. Not putting the toilet lid down before flushing the water allows a cloud of bacteria to explode into the air. This showering of bacteria can settle on nearby surfaces in the bathroom, including toothbrushes, towels and even walls. It can be known as the ‘aerosol effect’ to some scientists, but others refer to the unpleasant scenario as ‘toilet plume’. I don’t know which of his sisters he was referring to. She referred to the subject several times during her speech. I would like to refer back to something I said in my introduction. Experts warn that this increases the risk of viruses such as the winter vomiting bug, or norovirus, of transmitting to another person. Jason Tetro, a visiting scientist at the University of Guelph, said each time you flush ‘an aerosol is created due to the rush of water into the bowl’. Mr Tetro is also the author of The Germ Files: The Surprising Way Microbes Can Improve Health and Life (and How to Protect Yourself From the Bad Ones). 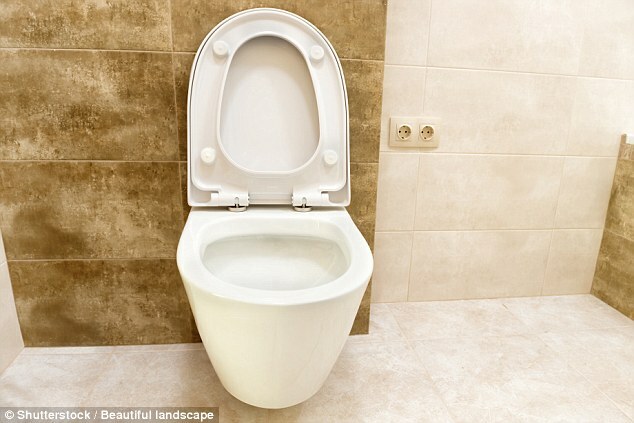 Over the course of a day, the average person is believed to flush the toilet up to six times, according to Realtor. This is the equivalent of 2,190 flushes – which can use up around 1.6 gallons (6l) – in an entire year. Fortunately, newer low-flow toilets have lessened the chances of the ‘aerosol effect’ but a lot of older toilets are still in use and so the risk is still there. This is because aerosol plumes can be transported up to 10 inches above a toilet seat when it is flushed – and remain in the air for up to an hour. They deposited their suitcases at the hotel. I deposited my luggage in a locker at the station. These sediments were deposited by floods thousands of years ago. A healthy diet can lessen the risk of heart disease. Keeping your weight down can lessen the risk of heart disease. They lowered the coffin into the grave. They lowered the old man into a chair. She lowered the blinds to block out the afternoon sun.